Managing Director Boy joined by Ow and the rest of team fishsiam visited the Ban River in Chachoengsao. Fishing close to the town the anglers soon latched into a large prehistoric predator which tested the anglers and their tackle to the limit. After an arm aching 2.5 hour battle which saw Ow, Boy and the rest of the team taking turns to battle the monster fish. The fish was finally brought to shallower water and measured at 1.9m the fish was found to be in immaculate condition. It was estimated to weigh 130-140kg and safely released after capture. With the better part of the day left for the team left to fish it was decided that the baits would be replaced in the hope of another take. Sometime later that afternoon an aggressive take would signal the start of an epic battle which would last some six hours! This Giant freshwater stingray would require the entire team and help from the many local onlookers that had gathered to watch this spectacular six hour battle! Finally the fish was brought to the riverside and measured at a width of 2.2m it was estimated to weigh 200-220kg and was identified as a female. 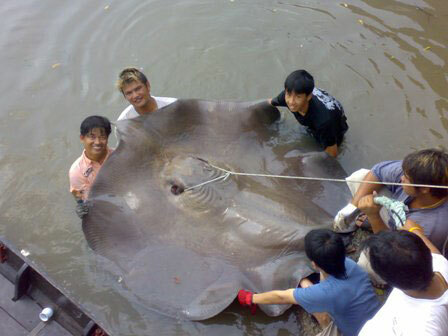 This brace of Giant freshwater stingray’s with an estimated combined weight of over 750lb’s is a truly magnificent achievement and is a testament to the remarkable angling skills of the fishsiam team.